I am delighted to have the opportunity to talk about lomilomi or lomi as it’s often called. Lomi is the heart-centered Hawai`ian massage modality that has kept my passion alive for 21 years AND kept me from ever experiencing burnout! Lomilomi is one of the great loves of my life, and I am deeply grateful for all my lomi teachers, those born in Hawai`i and those born Hawai`ian in spirit. What I hope to do in this article is to provide a comprehensive description of lomi, including its origins and applications. Within that context I want to weave an understanding of the ways in which lomilomi benefits and supports the practitioner’s on-going health and well-being as much as that of the client. Lomilomi is Hawai`i’s traditional, body/mind/spirit-based healing massage, practiced throughout the islands for many generations. Anyone who has visited Hawai`i is familiar with its lush beauty. Floral and forest scents abound, as do warm and gentle rains, soft sands, tropical birdsongs, misty rainforests, simmering volcanoes, and vibrant rainbows. Hawai`i’s energetic vibration is lighter (you actually weigh less there), and the healing energies are penetrating and profound. This nurturing, embracing land very naturally gave rise to the healing art form of lomilomi, which reflects a unique connection to the essence – or MANA – of the islands. Lomilomi is an unwritten art, having been passed down in families from the elder to the chosen child within the family. Learning was by observation for many years, followed by supervised practice on family members. There were no books for learning because the Hawai`ians had no written language. Theirs was a language of poetry, prose and spirit, imbued with many levels of meaning and expressed in their sacred dance of worship, the hula. Students of lomi were thus challenged to develop their IKE (intuition, inner sight) and their MAKIA (focus and presence). UA MAU KE EA O KA `AINA I KA PONO, which means “The land is perpetuated in righteousness.” We too are like the `AINA or land – perpetuated in righteousness. I have never forgotten my first experience of lomilomi some 21 years ago on the Big Island of Hawai`i. 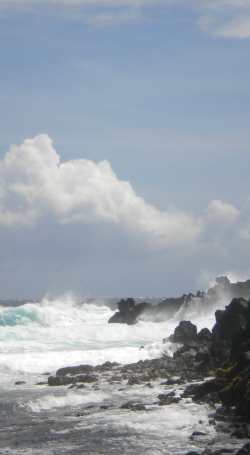 I received a two hour session near the ocean from a kahuna lomilomi (master) from the Island of Kaua`i. When the session ended I felt as though I had been time traveling, and had returned transformed, energized, rejuvenated. The specific techniques escape me. What I remember is having a profound awareness of my own essence; sensations of lightness; of being lifted and released from long-ago traumas; deep emotional letting go; timelessness; grounded fluidity throughout my being; and connection to everything around me. At the close of that session I knew I had found the life work I wanted to pursue. Lomilomi has at least as many styles as there are Hawai`ian Islands, and probably more. The style I have studied most and the one I teach is Temple Style Lomi, believed to have its origins on the Island of Kaua`i. This particular form utilizes forearms and elbows predominantly, and creates movement over the length of the body like ocean waves. I, the practitioner, am always in motion, swaying my hips in the gentle rhythm of the hula while allowing my forearms and hands to dance and to embrace, nurture, lift, open and love the tissue. It is through this easy, rhythmic movement of my whole body that I remain inspired, relaxed and fluid, and I save my thumbs for other tasks. Technique is one of the four components common to all styles of Lomi. The other three components are PULE (prayer); LA` AU LAPA `AU (herbal medicine); and HO` O PONOPONO (rites of forgiveness). The primary technique of lomi is about 75% body mechanics. This means I move from my core or center and use my whole body in delivering the strokes. In massage school I was taught to lean, but in lomilomi I was taught to lean more, to be very close to the client’s body, and to let the client receive my body weight in a press-lean-fall action. My hips move in unison with my hands and forearms, and are always aligned with the direction of the stroke. My knees are bent and my feet are often doing the steps of the ancient hula. I stay in continual motion, stretching and dancing around the table while moving the tissue in all directions. I am constantly making connections between the upper and lower body (heaven and earth); between left and right sides (feminine and masculine); and between front and back (past and future). What truly separates lomilomi from other massage modalities is first and foremost its attitude of reverence, of honoring the body. The beginning massage stroke is called HAMO, which means to anoint with sacred purpose or intention. Without exception lomilomi elders teach the importance of loving the body, loving the tissue into wholeness. Secondly, there is lomi’s inward call to me, the practitioner. I need to be applying the Hawai`ian healing principles in my own life. I need to be healing, loving and caring for myself. I need to be taking KULIANA (responsibility) for my thoughts, words and actions. I need to be developing greater awareness of myself as a spiritual being and of the sacredness and importance of my life. I need to know that every choice I make in every moment affects more than just myself because I am connected to everyone and everything. I need to understand that my conscious choices indeed have an effect on the evolving consciousness of this beautiful blue planet we call home. And, the extent to which I am responding to lomi’s inward call in large part determines the quality of healing energy I am able to channel from I`O (nameless mystery), the ultimate healer. Put simply, lomilomi is really about coming home, about remembering who we are, and that we are connected to one another and to all things. This is the deeper meaning of lomilomi. This is what continues to call me, to inspire me, to fuel my work, and to evoke passion and aliveness within me (and hopefully within my clients), each day of my life.